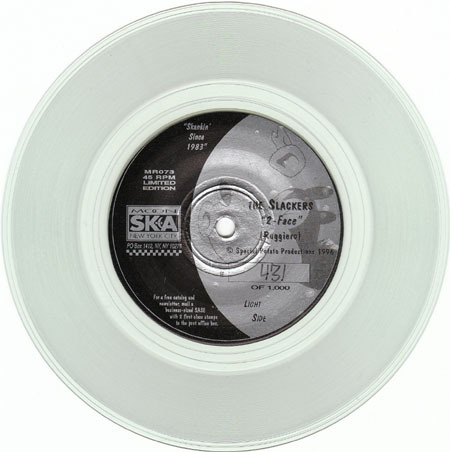 The Slackers' 2-Face 7" is one of the more valuable entries in the Moon Ska clear vinyl series. These versions of both songs can be found on the Better Late than Never album. When this 7" was released, the album was only available in one format (the original Moon Ska CD). The vinyl versions of the songs sounded much better. Since then, there have been several vinyl versions of the album, as well as a re-mastered cd version, so the sound quality of the single no longer stands out above the rest. Hand-numbered out of 1000.